The sinus in the cheek bone has a little drain hole which leads into the upper part of the inside of your nose. Normally the hole lets in air. Infection may drain from the sinus into your nose. This hole often gets blocked if the sinus becomes infected. Sometimes just some swelling of the lining of the nose during a cold will block the hole. 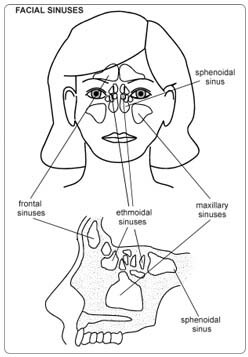 It causes unpleasant pains in the cheekbones and sometimes upper toothache – “sinus trouble”. Usually antibiotics and sprays will control the infection and let the hole unblock itself. In your case, you keep having blockages despite this treatment. Your sinus needs to be washed out to get rid of the infection. This should give the tissues a chance to heal properly. Stop smoking and get your weight down if you are overweight. (See Healthy Living). If you know that you have problems with your blood pressure, your heart, or your lungs, ask your family doctor to check that these are under control. Check the hospital’s advice about taking the Pill or hormone replacement therapy (HRT). Check you have a relative or friend who can come with you to the hospital, take you home, and look after you for the first day after the operation. Sort out any tablets, medicines, inhalers that you are using. Keep them in their original boxes and packets. Bring them to the hospital with you.